i cannot believe that it took approximately 28 hours from order to delivery - my kiwi’s here! and i cannot believe how much faster a wheel is than a spindle. i have 2 mini skeins of alpaca hanging to dry already (one completely raw, just fluffed a bit, the other with all the crap combed out and then fluffed) plus half a bobbin of white bfl. i’ll spin up another half then ply the two. and that’s with assembling the wheel and the skeiner and giving the wheel a couple of coats of wax (the skeiner only got one but it got sanded first - i discovered the sandpaper they send you too late for the wheel). the skeiner totally rocks, although it’s almost as big as the wheel istself. and i have nothing but praise for the wheel. i got this impression that somehow it would be shoddy or second rate as it seems to be generally dismissed as a beginner’s wheel. maybe i’ll find that i outgrow the high speed kit, or that it goes rickety with age, but right now i think it’s fantastic. the wheel runs on ballbearings so it’s smooth as anything. 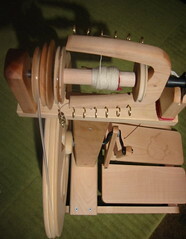 the double treadles are great, i can get it to start in either direction without having to push the wheel itself which i had to do on the traditional i tried out on saturday. it has an intermittent mystery squeak that’s so far proved immune to copious oiling but i’ll track it down. i really cannot get over how fast this thing is munching through my fibre stash, i’m onto the higher of the 2 standard ratios already :D and the bfl’s looking like it’ll turn out a decent, usable yarn. although i don’t have much choice how thick it’s soming out, it’s still perfectly passable. the alpaca’s going to take practice but i think the second (singles, the first time i haven’t plied, cos was too loosely spun) might actually be usble for something delicate. oh and the wheel and front room in general now smell heavenly as they recommend you rub the screws in candlewax to get them to go in smooth. the only one i had about is an ancient scented one from habitat that i’ve kept forever as it is the most wonderful scent i’ve ever smelled and i never wanted to use it up. it’s called euphoric (petigrain, geranium and orange) and i keep grinning as i get little whiffs of it, and having brief flashbacks to the time i bought it, about 5 years ago.